Erica Bunker | DIY Style! 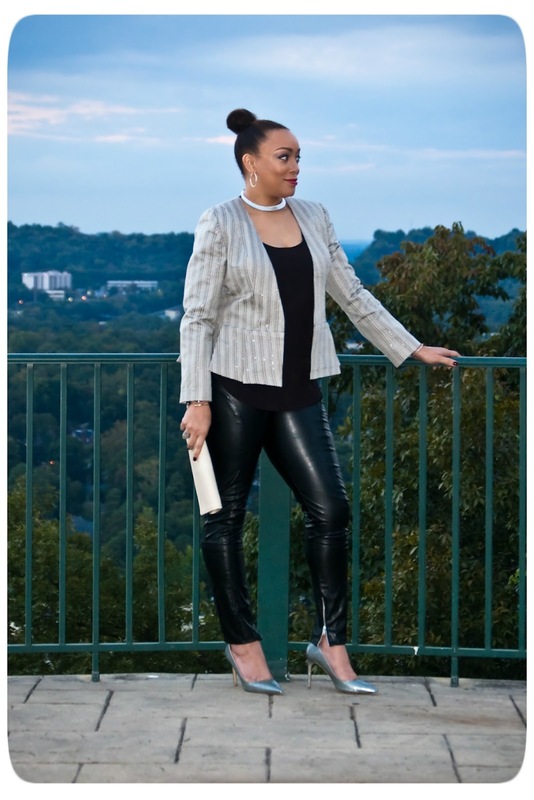 The Art of Cultivating a Stylish Wardrobe: Review: New Look 6231 | A Lurex Woven Peplum Blazer! 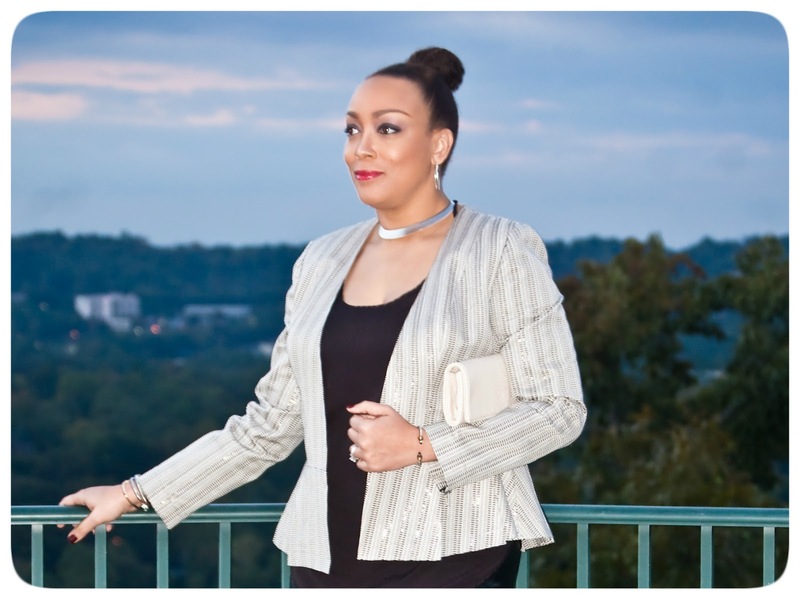 Review: New Look 6231 | A Lurex Woven Peplum Blazer! 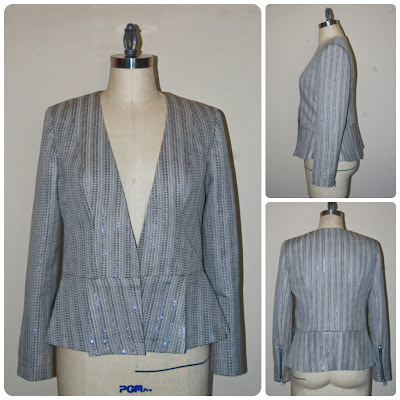 This peplum blazer is made from this gorgeous Carolina Herrera "woven fabric. Stone-colored, it combines black threads with graphite, gray with soft silvery strands, in a textured weave that can scarcely be described as medium-weight with the prettiest subtle sheen", from Mood Fabrics. And it was perfect for this collarless jacket! When I think Carolina Herrera, my first thoughts are elegance and sophistication. So I wanted to create something that would do this beautiful fabric justice. I chose New Look 6231. 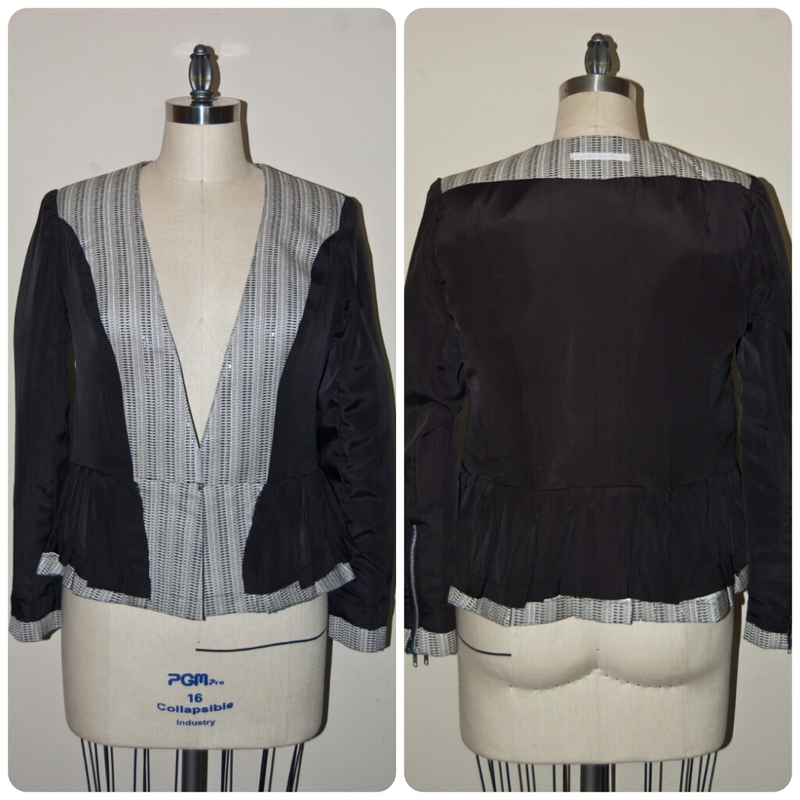 Even with the pleated peplum, the lines of this jacket are simple and uncomplicated. A perfect way to highlight the fabric. But in order to get a garment that I would be thrilled about, I had to make some alterations and modifications. First, I lengthened the body of the jacket by an inch. I made a 1 inch FBA. The shoulders are drafted really wide in my opinion. I had to shave an inch off of them. And since I'm not a fan of one-piece sleeves on tailored structured jackets, I swapped them out for a two-piece sleeve in a full-length. Here's a post I did previously regarding sleeves: "One-piece Sleeves vs. Two-Piece Sleeves". And I added 7" exposed zippers at the cuff. I like the bit of "edge" this detail gives this style. Show me yours, and I'll show you mine: Don't you love seeing the inside of a garment? I do! It reveals A LOT about one's construction skills! I also lightly tailored this jacket by block fusing nylon tricot fusible interfacing to the fabric. I added a back-stay made from muslin and I stabilized the neckline with a strip of silk organza. And I added a full lining. The jacket is held closed with a hook and eye closure. Note: Here are previous tailoring projects with lots of pictures and descriptions. As lovely as this fabric is, it does not take kindly to having seams ripped from it. You can easily catch those loosely woven threads. I learned that the hard way! So try to get it right the first time! I'm already planning additional outfits in my head incorporating this jacket. This is going to be such a fun piece to dress up or down this season! OMg I am so glad I bought this pattern about 3 weeks ago! You have made we really want to make it. I love your fabric choice and it goes great with those leggings. Thanks again for great inspiration. Another stunner, Erica! Absolutely gorgeous. I love your fabric choice and style - you really inspire me. Well done and thanks for posting. O.M.G Erica! YOU ROCK! This is STUNNING! I made this jacket a few weeks ago. I wanted to line it but was pressed for time so I just used the facings. I'm going to read your posts on tailoring because I definitely want to make another version. Drop. Dead. Gorgeous! Love everything about it! 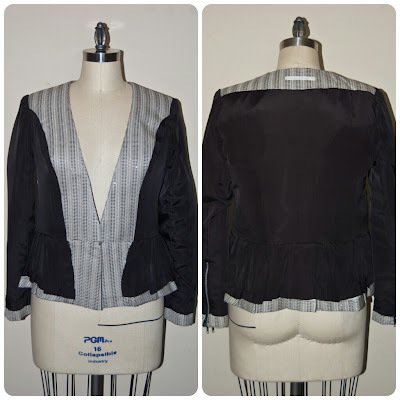 Perfect fabric, perfect silhouette, and perfect construction and pattern changes! 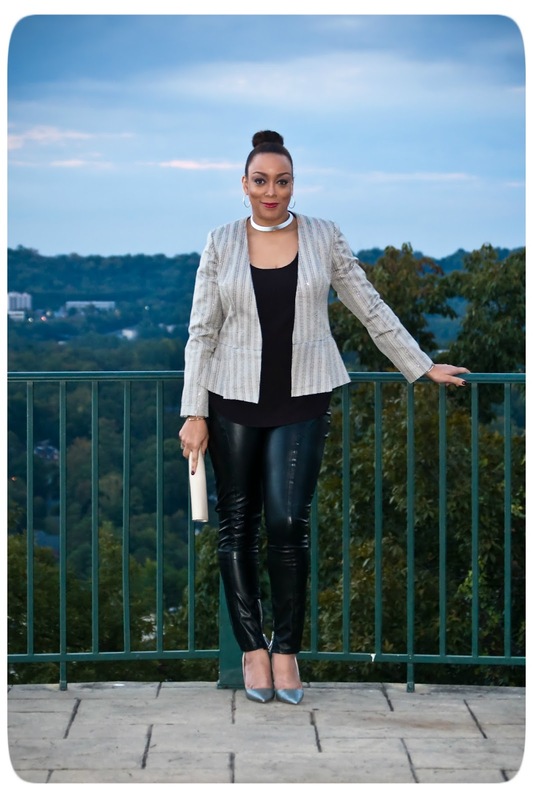 You have really been killing it lately, Erica!!! Just adore your last three entries. Thanks so much for sharing all this with us! Very inspiring. Fabulous jacket. I love how you constantly mix and match your sewn garments into many different outfits. Pure genius! Plain and simple....pure genius. Gorgeous jacket! I love your pants as well. 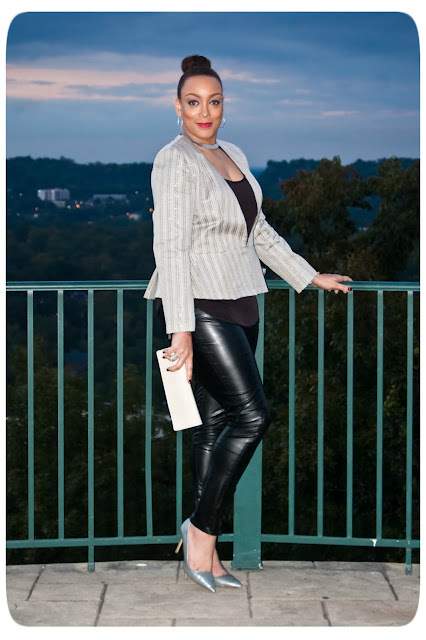 Love this outfit Erica! The jacket is so classy and tres chic, & just wondering, did you make the pants as well? Sensational!! Another winner Erica! Love this look! It is beautiful. You look awesome in your outfit. Thank you Erica, you have just opened my eyes and encouraged me in what I am doing with my kniting. Your DIY Chanel Jacket is fantastic - that is how I have found your blog. Please, let me allow to copy the words of COCO Chanel on my blog, to convince my followers, that there is nothing wrong in creating the DIY fashion. Great jacket. I really like how you show things in different ways too - very inspiring. This jacket looks great on you! I also bought this pattern and i need to narrow the shoulders also but i'm not very sure how to do it. Can you please help with some info on how to make this alteration? Thank you. Wow, I just picked this pattern up and boom...here you are giving a wonderfully detailed review and fashion display! Glad to know some of the pattern issues before hand! Great job -- as always! I seem to have to make more alterations on New Look patterns more than any other brand I sew.